This is very interesting and I had to share. Children in Argentina (Brittan's husbands native country) say "upa" (oopa) when they want to be picked up. As you pick them up you would reply "upa-lala." What a perfect name for a carrier! Brittan was kind enough to send me a medium eco-bag to test out. Size approx. 12" x 12"
The inner waterproof liner is made of polyurethane laminate (PUL). The exterior is made of cotton. I have been using it on the go. It fits well into the diaper bag. It's great for diapers but I have been using it for dirty washcloths and wet clothes. To maintain the dark color I have been washing it with like colors and air drying. I dry it flat and even after several washes it still looks like new. I was worried that the dark color would fade but this is what Brittan told me. "You should be able to wash any color bag on warm wash & cold rinse and they shouldn't fade. The designer fabrics are meant to be washed and washed and washed." It holds even the wettest wash cloths and clothes without a leak! 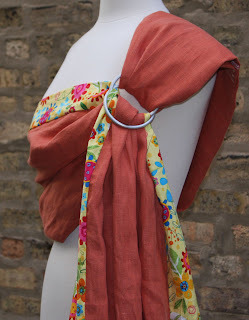 The loop is perfect for hanging around your wrist, a stroller or a changing table. The handmade box it came in! The tag is tied on with twine. The zipper is easy to grasp. I was able to fit 5 diapers in it and zip it closed. This bag is so well made and super cute! I love how sturdy it is and the loop is the perfect size. I ♥♥♥ the handmade box it came in. Isn't it great? Upa-lala doesn't use any plastic in their packaging. Even the tag was tied on with some twine. Two thumbs up from me! Most of all I love that this was handmade with lots of love. Upa-lala has great quality products and wonderful customer service to top it off. There are so many designs to choose from and upa-lala.com is easy to navigate! I would love to try one of their carriers. 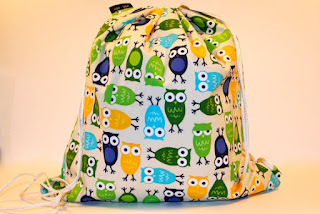 Head over to Upa-Lala or Etsy and get your own eco-bag or carrier! All Earth Faerie Momma readers get a special discount. Use the coupon code EARTH for 10% off until August 10th. Come back July 30-August 10, for the Just For Baby Giveaway Hop and you will have a chance to win a baby prize pack including a medium eco-bag (wet bag) from Upa-Lala. The giveaway will be open to the US & CAN. Just look for this artwork on my sidebar.